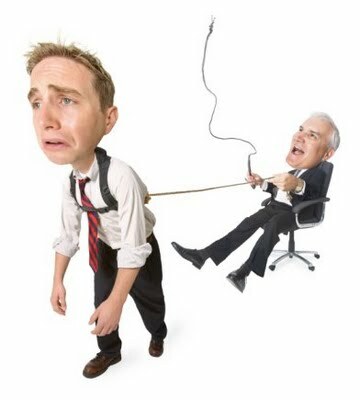 Is your management style strangling your team? In my past life in corporate, I remember how damaging it was when an inexperienced new boss was appointed. Not only was Sally new to our department, she was new to the job of boss. Whereas our previous manager John had rewarded new ideas and new thinking, now we could no longer take initiative and be innovative. Sally created more and more rules, and the slightest deviation from the rules was punished, even if you produced a better result than you would have by following the procedures 100%. Creativity and fresh thinking was simply not tolerated. Everything, even the most straightforward tasks, had to be approved by Sally first, regardless of your level of experience. She checked everything we did in micro-detail and cracked the whip on petty issues. We were floundering without the strategic direction that John had given so well. The culture in our department changed from one of trust and innovation to bitchy backstabbing. The innovators quickly left, and productivity deteriorated dramatically. Under John’s leadership, people would come in early and work late because they were passionate about their jobs, and they worked hard until they got their work done, and done well. Now the only people left in Sally’s department were clock watchers, churning out mediocre work just to get the job done and get her off their backs. It was disheartening to see all of John’s work destroyed. I stuck it out as long as I was able, but eventually left before a small part of me died. If you’ve worked in corporate, chances are you’ve had a boss like Sally (or at least a boss who has some elements of Sally) at some point in your career. I’m a strong believer in seeing the positive in everything. This experience was no different. We all need a bad boss like Sally to appreciate good bosses and to become better bosses ourselves. So what valuable lessons can we take away from managers like Sally? 1. Too many rules and regulations strangle innovation. Companies tend to add more new SOPs (Standard Operating Procedures) over time, and rarely take any away. This means that the longer a company has been running, the more procedures it typically has, and the more red tape your workers need wade through to get anything done. Nothing kills innovation faster. Innovators need freedom, and the space to experiment and create. When you have an SOP outlining which SOP to follow, and people cannot take initiative without checking the SOPs, it’s time to cut back. In 1994 when Gordon Bethune joined Continental Airlines as CEO, the troubled airline consistently ranked stone last in every performance metric, from on-time performance to customer complaints and mishandled baggage. Bethune won global acclaim for leading one of the most dramatic corporate turnarounds in US history. How did he do this? He killed the red tape. Continental went on to thrive under his leadership, earning more awards for customer satisfaction than any other carrier. So how can you cut the red tape in your business? Start afresh. Assess how to make your rules and regulations guide and support what you’re trying to achieve. Do you really need a rule for everything? Have procedures only when they are essential, and prune away the redundant or innovation-stifling ones. This isn’t to say you should categorically cut all procedures throughout all areas of the company.In some departments, procedures and processes are vital – having a creative accountant who bends the rules is just asking for trouble. However in departments like product development, the more freedom you give your workers and the less their creativity is constrained, the better the results you’ll get from them. 2. Reward new ideas and quash the fear to innovate. Are your people too afraid to be creative? When people generate new ideas, are they rewarded for their innovation (by finding ways to integrate their ideas into the business)? Or are their suggestions shot down, not talked about, not encouraged? Rewarding new ideas sends the message that it’s OK to try. Try including innovation-driving metrics in your workers’ performance appraisals. Examples include “number of new ideas you come up with” and “number of your ideas that were successfully implemented”. These will motivate them to be more creative and to try new things. 3. Reward risk. We all know the phrase “Nothing ventured, nothing gained”. In order to innovate, you need to take some chances. Innovators thrive in an environment of “Don’t ask for permission first, ask for forgiveness later”. Why? Because that gives them the space to experiment and take initiative, and makes them feel empowered. Let people fail, that’s when they really grow. As long as they learn from their mistakes, those are positive actions that move your company forward. 4. Make a plan. Our 7-year-old son Jayden is very creative. He loves inventing new things and solving business challenges. To encourage this entrepreneurial streak, whenever he comes to us with a problem, we don’t tell him how to fix it. Instead we say, “Make a plan.” If your people come to you for answers, and you simply give them, you’re rewarding helplessness. You’re teaching them not to use their brains to uncover the fantastic ideas they have. How to fix this? As a manager, stop answering. When they come to you with problems, ask your staff, “How would you solve this?”, and let them come up with the answers themselves. Encourage them not to come to you with problems unless they also bring their own ideas for solutions. Unlock their problem-solving abilities, and watch them shine. 5. 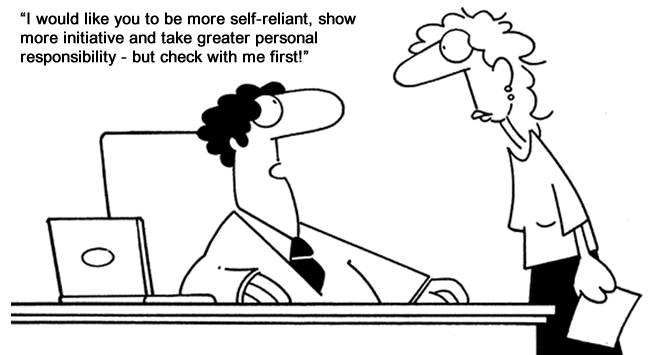 Micromanagement destroys trust and your workers’ passion and pride in their work. We all know people who say, “The only way to make sure the job gets done properly, is to do it yourself.” Nothing destroys trust more.Checking everything your staff do, sends the message that you don’t believe they can do the work properly, and that you can do it better yourself. Heard the expression “Guilty until proven innocent”? In a business context, micromanagement shows you label your people as guilty of doing bad work before they’ve had the chance to produce great work. If you’re talented, would you want to work in an environment like this? I’m pretty sure not. To keep talented people, show them you believe in their abilities. Give them the guidance and strategic direction they need, and then let them get on with the job. Talking to the previous point, if they ask for help, give it in a way that encourages them to find the answers themselves. But don’t help them if they don’t ask for help or don’t need it. Let go of the ropes. 6. Don’t do one-size-fits-all. A classic mistake that many inexperienced managers make is to treat all staff the same. This can be very damaging to morale. Every worker has different needs based on their experience and unique drivers. So get to know your workers and what motivates them as individuals. Your more junior staff need more guidance than more experienced workers. Give your experienced staff more freedom and autonomy, and don’t overcrowd them. Trust them to get on with the job. Encourage them to take initiative. This will free you up to spend more time supporting your junior workers, who need it a lot more. Leadership is like parenting. There is no right or wrong, and a lot of it is trial and error. We all need the space to try, and to learn what works. Unclip the wings of your people and watch them soar. Categories: Business, Entrepreneurship, Leadership, Management | Tags: autonomy, experienced, initiative, macro-management, micro-management, micro-manager, one-size-fits-all | Permalink. I couldn’t agree with you more Colette. Innovation can suffer due to a boss who doesn’t allow their team to be creative. I have personally experienced those SOP’s that just don’t allow any improvement or effectiveness and causes delays if ‘Sally’ is not there to sign off every tiny thing. Thanks Tryphina, good point. Those SOPs were one of the reasons I changed industries out of pharma into social media to start MBAconnect.net. I think everyone has experienced a Sally at some point or probably been a Sally at some stage of their management careers, especially when they first became a manager. PS Do you get Finweek mag? If not, and you like these posts, you’ll be able to get it before it goes on my blog. My hubby Gavin and I both write a weekly management column for Finweek, and they have first rights to these articles. So after mine get published in Finweek I post them on my blog. It’s a pleasure Colette, I can relate to the article. I also had to move on from that company. I have to say that since I met you in person at the presentation you gave at the business school expo in Sandton in August, I have been a lot more aware of the importance of social media and how it can be used as a powerful tool in many ways. Good for you for making that change. I’ve just started blogging myself and since completing my MBA, I’d like to also blog about my learnings and applying them in the construction industry. I don’t get Finweek. I might consider getting the digital copy though.